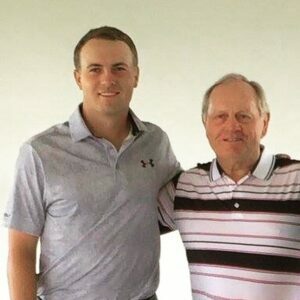 Jack Nicklaus with 2017 Open Champion Jordan Spieth. Jordan Spieth’s Open victory was a great display of guts, determination and skill. This was very enjoyable to watch. Matt Kuchar was terrific. He played very steady, solid golf. Matt just couldn’t make any putts. But he played such good golf. I guess you could say Jordan provided all the excitement on both sides of it. Jordan semi had the wheels coming off on 13 with that tee shot. And while it did take him a long time between the tee shot and the next shot, Jordan figured out what to do. I don’t know if I would have figured out to go over to the driving range for that shot. That was an unbelievable decision and unbelievable 5. That putt was so huge. Much like Sergio Garcia’s par save at the 13th hole at Augusta National in the final round of the Masters, I believe Jordan’s bogey at the 13th hole today was the key to his round. He made that putt and all of a sudden he turned it on. It was as if he said, “Hey, I’ve let this thing get away from me. I’ve got to get back to work.” Then he went boom, boom, boom…. To follow up that bogey on 13 with great golf shots and great putts, and play the final five holes in five under par, I was just very happy for him and very impressed to watch all that guts, determination and skill. I think you have to learn to play links golf. Not only is it fun, but it’s also an acquired skill. You have to spend time learning how to do it and what to do in certain situations. It is a huge exercise in discipline. Much was said today about the fact Jordan and I were able to win three legs of the Grand Slam before the age of 24. But if you look, he’s won 11 tournaments and I had won eight before 24. If you look at his victory total, his win today and the way he won today, Jordan has shown an amazing display of maturity for someone so young, and he has been doing that for a quite while.